I had the opportunity to go to Fleming's to try some wines from Husic Vineyards. 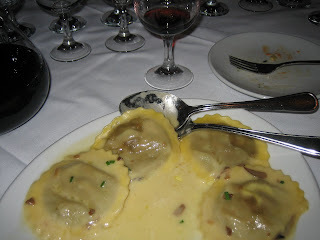 Fleming's was hosting a wine dinner (along with the chef from Roy's), and they had invited some media beforehand to try some of the wines and meet the owners, Julie and Frank Husic. I was super happy to try the wine and meet the lovely owners, even though jealousy was probably seeping out of my pores. To live in Napa Valley and own a vineyard? Oh, what a life!!! Their wonderful wines were a treat, especially because they are definitely out of my price range. I tried a Chardonnay that I actually enjoyed (I am not usually a fan of them) and some wonderfully robust Cabernet Sauvignons. I also got to try some of Fleming's Happy Hour Menu items. I had no idea Fleming's even had a happy hour, and a good one at that! Their happy hour is "5 for $6 'Til 7pm" and they offer 5 wines, 5 cocktails, 5 appetizers all for $6 each! Pretty ridiculous price! 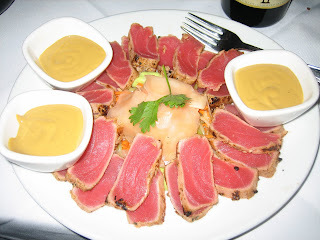 I tried the Seared Ahi Tuna which was served with mustard and some thinly sliced ginger. This was great and seared to perfection. I wish I had taken more hahahaha. The Mushroom Ravioli was by far my favorite. I loved the cream sauce with the woodsy mushroom flavor. This was so luxurious. I would definitely order this again and again and again....... In fact, I think this is also available as an entree as well. Have you ever been to Fleming's for Happy Hour or dinner? It looks like one of those great places that you would go to after a Graduation or for a big business meeting.